Welcome to Douglastown Community Church! Come just as you are! Don't worry about what you look like, or if you're "spiritual" enough. You won't be judged because we're all part of the same story. Bring yourself or the whole family. We offer child care for tots up to age 5, though kids are more than welcome to attend the service, too! Join us for a thoughtful worship service at 10:00am that includes beautiful music, gospel-rich sermons and other opportunities to draw closer to our Creator and Redeemer. Don't hestitate to contact us with questions. We can't wait to meet you in person! 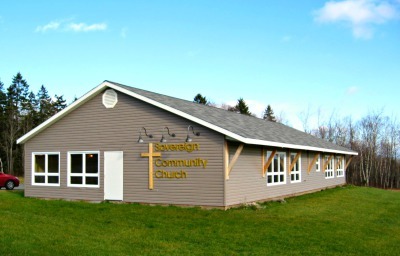 If you're checking out different Miramichi churches, be sure to visit us. We are a PCA church that remains firmly rooted in God's Word and the gospel of Christ, striving to be fully engaged in our community for personal and city-wide renewal. Amos: Before the Earth Shook Rev. Joash Schumpelt The Prophet Amos was not trained as a prophet, but his words echo with power and precision. God used Amos warn the people of Israel that they had chosen comfort, wealth and pleasure over their obligation to God and to their fellowman. The consequences of their sins would be dire if they did not repent and return to God's law. For the church today the book of Amos corrects our sinful materialism and teaches us how to raise our voices like Amos to warn of the coming judgment. True life change starts with understanding the Good News of Christ Find opportunities to deepen your relationship with your Creator - the same one who knew intimate love with the Son and the Holy Spirit before time began, and wanted to share this love by creating us to experience it! Browse and listen to past sermons recorded at DCC. Listen to sermons on-the-go, at home or tune-in for an entire series. This collection has been recorded for you. Bookmark this page and share it with friends!